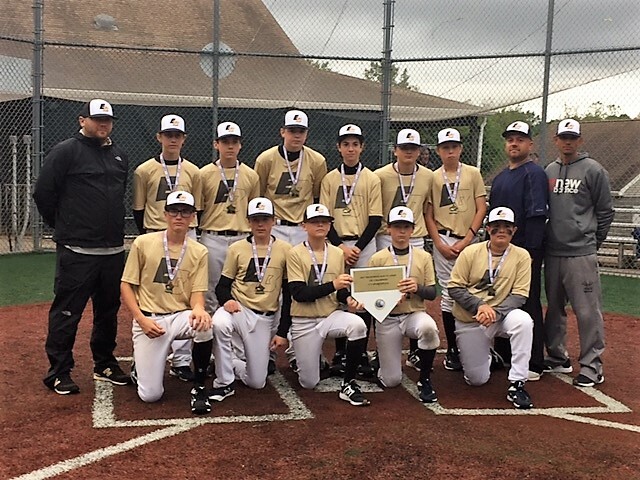 The newly formed Evolution Baseball program wasted absolutely no time in making sure that their name reverberated throughout the Northeast, taking home the title to cap off their opening 13U tournament at the CT Sportsplex Memorial Day Classic, while simultaneously announcing their presence to the travel baseball world with authority. Evolution Baseball sent Nolan Puglisi (Paxton, MA) to the mound in the opening game of pool play as they got the tournament started with a matchup against the WOAC Indians out of Waterbury, CT. It didn’t take long for the Evolution offense to provide Puglisi with all the run support he would need, as Matt Lussier (Wellesley, MA) got the offense rolling in the top of the 1st with a leadoff double, taking third just a moment later on a passed ball. With runners on 1st and 3rd and nobody out, Alex Irizarry (Amherst, MA) followed up a David Blair walk with a deep fly ball to centerfield, scoring Lussier from third. EB went on to blow the game wide open in the top of the 2nd, batting around the lineup while scoring 8 runs in the frame. A single from Puglisi sandwiched between walks issued to Jimmy Railsback (Boylston, MA) and Jack Blair (Northboro, MA) found Evolution with the bases loaded and nobody out. Ryan Porth (East Longmeadow, MA) drew the first of five consecutive bases loaded walks to plate Evolution’s second run of the game. Evolution went up by a score of 6-0 following the five consecutive walks, and still had the bases loaded as Clark Churchill (Windsor, CT) came to the plate. Churchill laced a run scoring single to CF to put EB up 7-0. Puglisi’s second hit of the inning, an RBI single, pushed the lead to 9-0 heading into the 3rd inning, and Puglisi would put things on cruise control from there. The RHP tossed 4 shutout innings while allowing just 3 singles to the Indians offense on his way to earning the victory, as Evolution, propelled by collecting 9 hits and 8 walks in just 4 innings, would go on to win the game by a final score of 10-0. Jimmy Railsback took the mound in the Saturday nightcap, as Evolution Baseball, looking to move to 2-0 in pool play, took on Nor’easters White (Tewksbury, MA) in the 8:00 PM game. After spotting railsback an early 3-0 lead, the Evolution offense erupted for 11 runs on 10 hits in the top of the 3rd inning en route to a decisive 14-0 victory. Leading the way offensively for Evolution were Alex Irizarry (2-3 w/ 1 3B, 2 R, & 2 RBI), Jack Blair (2-2 w/ 1 R & 1 RBI), David Blair (2-4 w/ 1 2B, 1 R, & 2 RBI), Dante Reno (2-2 w/ 1 2B, 2 R, & 2 RBI), and Drew Renzella (2-3 w/ 2 R). All together the EB offense combined for 14 hits while also drawing 6 walks in the contest. Railsback (3 IP) and Porth (1 IP) combined to throw a 1 hit shutout in the run-rule shortened game, helping Evolution to the #1 seed with a record of 2-0 in pool play and a combined score of 24-0 through two games. The opening round of playoffs found Evolution facing off against the CT Gators (Orange, CT), with Railsback once again taking the mound. The Gators were able to utilize a strong running game to take advantage of walks and uncharacteristic errors by the Evolution squad, carrying an 8-1 lead into the 4th inning. A defensive change behind the backstop resulted in Drew Renzella completely shutting the Gators’ running game down with 3 consecutive would be base stealers thrown out, shifting momentum to the EB dugout. EB carried their newfound energy into their half of the 4th inning, scoring three 2 out runs courtesy of a 2 RBI double from Jimmy Railsback and an RBI single from Nolan Puglisi, pulling Evolution within 3 runs at 8-5. After pushing another run across in the 5th inning the change in momentum rolled right into the 6th inning as well, with Evolution responding to two unearned Gator runs by loading the bases on 3 consecutive singles from Churchill, Railsback, and Puglisi to start the inning. Two straight 6-3 FC’s plated just 2 runs, and for a brief moment it appeared that Evolution might squander a golden opportunity – enter Matt Lussier and more 2 out magic for EB – Lussier crushed a deep triple into CF to score the 3rd run of the inning and then scored a run himself on a David Blair RBI single, vaulting Evolution to a 10-10 tie. A 1-2-3 defensive inning set the scene for a potential dramatic ending to take place in the bottom of the 7th inning, and Evolution would not disappoint. Drew Renzella got the dramatics started with a hard single up the middle to begin the inning. A single from Dante Reno (Sturbridge, MA) and a walk to Churchill once again had EB up with the bases loaded and nobody out. Jimmy Railsback flared a shallow fly ball into right field but it was not deep enough to score the run, bringing Nolan Puglisi to the plate with the winning run just 90 feet away in a must win game. Puglisi would deliver when it mattered most, launching the game winning, walk off single into right field, and sending Evolution to the semifinals with a remarkable comeback victory. 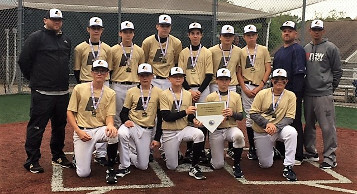 In their second game of the day Evolution Baseball took on the 13U squad from Wolcott Legion in a semifinal matchup. Once again, the Evolution offense proved to be overwhelming, pounding out an impressive 16 hits in just 4 innings. Leading the way offensively with multiple hit performances were Matt Lussier (4-4 w/ 3 RBI & 2 R), Clark Churchill (2-3 w/ 2 2B, 2 RBI, & 1R), Ryan Porth (2-2 w/ 3 RBI & 3R), Alex Irizarry (2-3 w/ 2 RBI & 1R), David Blair (2-4 w/ 3 RBI), and Charlie Denomme (2-3 w/ 2R). Evolution was stellar on the defensive side of the ball as well, not making a single error on the contest. Clark Churchill and Ryan Porth combined to throw 5 innings of 2 hit, 2 run baseball, helping EB move on to the tournament championship. Taking the field for the 3rd time on the day, Evolution Baseball went up against a strong CT Hank’s Yanks squad in the championship game. The Yanks wasted little time jumping out to a lead, scoring early and often en route to an 8-0 lead after just 2 innings. Drawing on their comeback performance in the quarterfinal game against the CT Gators, Evolution Baseball would not go quietly, utilizing a mentally tough “rock” approach to scratch and claw their way back into the championship game. Entering the bottom of the 2nd inning down 8-0, 3 consecutive singles from Dante Reno (Sturbridge, MA), Clark Churchill, and Nolan Puglisi sent Jack Blair to the plate with the bases loaded and nobody out, and Evolution poised for a big inning. Blair would draw a bases loaded walk to get EB on the board, setting the table for a bases clearing double from Charlie Denomme (Wellesley, MA), cutting the Yanks lead in half, while pulling Evolution to within 4 runs at 8-4. The Evolution offense was not done however, as RBI hits from Matt Lussier, David Blair, and Alex Irizarry cut the deficit to just 1 run going into the 3rd inning. Following a shutdown inning from Matt Lussier, the Evolution offense got right back to work, with 8 consecutive men reaching base to start the bottom half of the 3rd inning. An RBI single from Jack Blair (Northboro, MA) tied things up at 8-8. J. Blair’s base hit was followed by RBI singles from Denomme, Porth, Lussier, and D. Blair, giving Evolution a 12-8 lead before the offensive explosion was capped off with a 2 run double from Drew Renzella (Wellesley, MA), putting EB on top by a score of 15-8. The offensive onslaught continued with Evolution plating 4 more runs, securing an impressive 19-8 win in the championship game which saw EB score an astounding 19 consecutive unanswered runs. The EB offense banged out 14 hits while drawing 8 walks in the championship matchup to secure some hardware in their first ever tournament appearance. Evolution outscored their opponents by a score 69-21 over the 5 game tournament (26 total team at bats) putting up an average of just under 3 runs per inning & almost 14 runs per game, while compiling a 5-0 record in tournament play.